NU Votes volunteers speak to students at a voter registration booth in September 2016. 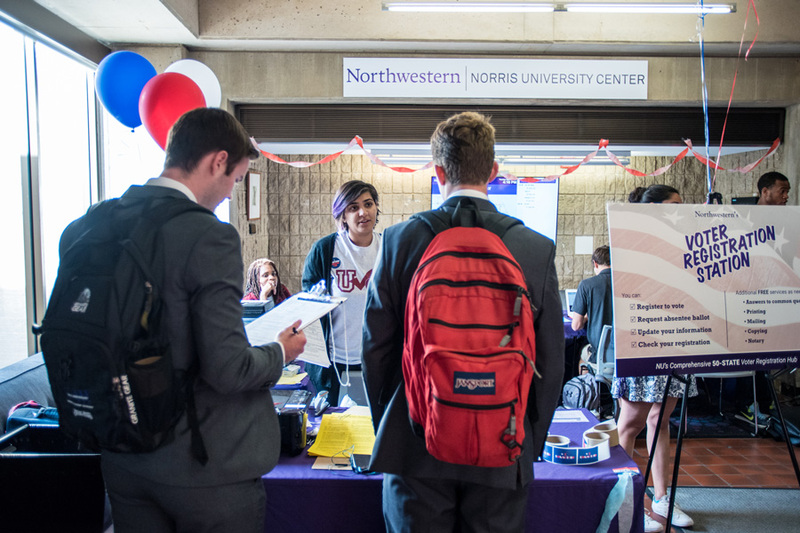 Northwestern won five awards for civic engagement at a ceremony Thursday, including the highest increase in voter registration among all U.S. universities. Northwestern won five awards for civic participation Oct. 19, including one for the highest increase in voter registration among U.S. universities, according to a news release. The ALL IN Challenge Awards Ceremony, held in Washington, D.C., recognized colleges and universities for promoting civic engagement. The challenge uses voter registration data and tracks participation rates from more than 1,000 colleges and universities to determine award winners. NU also won the awards for the highest voting rate among large, private four-year institutions and the standout administrator award. The accolade recognized work done by Rob Donahue, associate director of the Center for Civic Engagement, according to the release. “We’ve worked with colleagues across campus — students, faculty, staff, administrators and community partners — to try to make responsible civic engagement a cultural norm at Northwestern,” Donahue said in the release. Ninety-one percent of eligible NU undergraduate and graduate students were registered to vote in 2016, compared with a 71 percent average across U.S. institutions, according to the release. Additionally, 64 percent of eligible NU students voted in 2016, compared to 50 percent across institutions. The voting rate at NU increased by 15.2 percentage points between 2012 and 2016. Donahue attributed the University’s success to the Center for Civic Engagement’s NU Votes program. The program, created in 2011, hosts student registration stations and events throughout the year to create “awareness and enthusiasm” for civic engagement, according to the release. The center also runs “Voter Vans,” which shuttle students to polling stations during elections. This year, NU Votes representatives held voter registration stations throughout campus on move-in day. By the end of the day, more than 96 percent of eligible freshmen were registered to vote. Steffany Bahamon (McCormick ’17), a former Center for Civic Engagement fellow, told The Daily that NU Votes not only promotes the importance of voting, but also makes the process easy. Bahamon, who volunteered with the voter registration stations and “Voter Vans,” said the awards mean a lot to her personally and to the University as a whole.